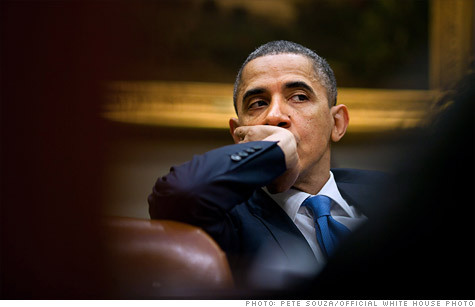 It's not just the debt ceiling that has President Obama worried. NEW YORK (CNNMoney) -- Even if lawmakers manage to avoid a self-inflicted calamity by raising the debt ceiling, another economic scourge is lurking just around the corner. It's not the nastiest of "D" words -- default. Rather, it's "downgrade." The contentious political theater playing out in Washington is increasing the risk of a rating agency slashing the U.S. credit rating. Rating agencies -- Standard & Poor's, Moody's and Fitch -- analyze risk and give debt a "grade" that reflects the borrower's ability to pay the underlying loans. The safest bets are stamped AAA. That's where U.S. debt currently stands -- and has stood since 1917 when Moody's first assigned a rating. But that might change in the very near future. "For the first time in history, our country's AAA credit rating would be downgraded," President Obama said Monday night. "We would risk sparking a deep economic crisis --- this one caused almost entirely by Washington." S&P, the most outspoken of the agencies in recent months, has warned that even if the debt ceiling is raised, it might dock the nation's credit rating. That's because the agency is not only concerned with whether the United States pays its bills. It's also worried about the long-term debt outlook and the chance that politicians will continue to dither and not act to lower the debt. After a downgrade: A downgrade could wreak havoc in the United States and roil global financial markets, which rely on U.S. debt as an essentially risk-free investment. Government-backed agencies like Fannie Mae and Freddie Mac would be downgraded. Municipal debt, banks and insurers would face possible action. And investment decisions would become complicated for large institutional investors that are required to hold highly-rated securities. At the same time, the fallout is difficult to predict, principally because it's never happened before. In addition, the market might temper its reaction to a downgrade because the United States certainly has the ability to pay its bills for years to come. Plus, a downgrade would really just amount to the agency's opinion. Federal Reserve Chairman Ben Bernanke articulated that view in April when S&P placed the United States on credit watch. "S&P's action didn't really tell us anything," Bernanke said. "Everybody who reads the newspaper knows that the United States has a very serious long-term fiscal problem." 0:00 / 4:20 Will the U.S. pay its bills? Congress on the spot: So what kind of debt deal does Congress need to come up with in order to avoid a downgrade from S&P? The bigger the better. Here's what S&P has said: The country would keep its AAA rating if Congress strikes a deal in the $4 trillion range and S&P concludes "that such an agreement would be enacted and maintained throughout the decade." A $4 trillion debt-reduction plan sounds a lot like the agreement that was being negotiated by Obama and House Speaker John Boehner last week. But talks blew up, and the plan seems to have been shoved aside in favor of two less ambitious measures as the debt ceiling ticks closer. And this is where things get dicey. Senate Democrats have a plan. House Republicans have plan. Both are nowhere near $4 trillion in size. If Congress settles for a modest increase in the debt ceiling, or a plan that, while avoiding near-term default, does not improve the country's future debt-to-GDP ratio, S&P will be less than thrilled. That outcome, the agency said, is "inconsistent with a 'AAA' sovereign rating." In other words, brace for a downgrade. Now, it's unclear exactly what S&P and the other agencies are thinking about the specifics of the two smaller plans currently under consideration in Congress. S&P did not return a call seeking comment. But it seems likely that the two-step mechanism favored by House Republicans will not be viewed as a positive due to the amount of politics involved -- and in the middle of an election year, no less. S&P said it could downgrade the country's long-term rating if it concludes that "future adjustments to the debt ceiling are likely to be the subject of political maneuvering." The plan favored by Senate Democrats has some problems of its own. Around $1 billion of its $2.7 billion in savings counts savings from winding down the wars in Iraq and Afghanistan. But that money would not have been spent in any case. Of course, first things first. Some sort of plan has to make it through Congress before Aug. 2. If lawmakers fail to raise the debt ceiling, it is expected that S&P will downgrade U.S. debt. The rating would end up at what the agency calls "SD," or selective default, as soon as Treasury misses a payment. The agency would keep it there until the payment is made. If the government is to avoid a selective default, it must make all its interest and principal payments.